Lu Xun Cannot be the target of Steal or Capture. 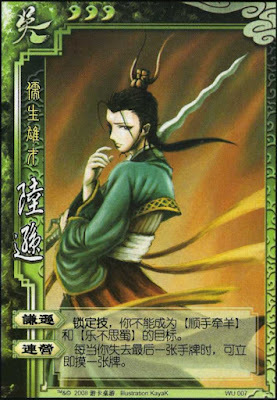 Whenever Lu Xun uses or loses his last hand card, he immediately draws a card. When Lu Xun runs out of cards, he draws one card immediately via "Linked Camps." If he just used a tool card and draws a Negate, for example, he can use this Negate against an enemy Negate. "Linked Camps" always guarentees that Lu Xun has at least one hand card. When Lu Xun uses Draw 2 as his last card, he draws three cards (he gets the first one immediately when playing Draw 2 and running out of hand cards). Because Lu Xun cannot be targeted by Steal or Capture, a player that mistakenly uses these cards on him need not discard the cards. Because that move was illegal, action was never considered having been played, in the event of a mistake these cards are returned to the player's hand. "Humility" does not protect Lu Xun against character abilities that allow one to take another character's cards and acquire them, such as Sima Yi's "Feedback" and Zhang Liao's "Raid." These abilities do not equate to using the Steal tool card. Lu Xun's "Humility" protects him against the two nastiest tool cards in the game. It is very easy for a player to take this for granted. Lu Xun's "Linked Camps" provides him considerable protection against Break and Starvation. Because Lu Xun always has a hand card, these tool cards do not affect him as much as they do other characters. 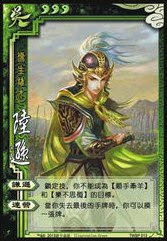 "Linked Camps" provides Lu Xun a degree of protection against many weapons, including the Gender Swords, as he will not mind to discard an addition card since he will draw another when he runs out. The Ice Blade is not as significant against Lu Xun because he will not run out of hand cards. Finally, Lu Xun is immune to the effects of the Ancient Knife since he always has a hand card to avoid the 2 damage penalty. Lu Xun is incredible with the Crossbow if he continues to draw cards that he can use during his turn. He also is good with the Serpent Blade, as this can help him get rid of cards that he cannot use. Lu Xun's abilities work very well in a one-on-one battle. Lu Xun's "Linked Camps" always provides him with hand cards, but there is no guarantee that he will draw the cards that he needs. If he 'gets stuck' with a card that he cannot use during or outside of his turn, he will be open to all types of assaults and he will not be able to get a new card until his next turn, assuming that he survives. Lu Xun is quite fragile. His defensive powers are very good in many respects, but there is nothing that he can call upon to consistently prevent extremely offensive characters from attacking him repeatably. Lu Xun does not have much to offer a team. 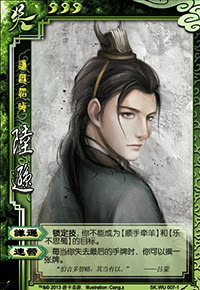 Zhang Liao - When all but one of Zhang Liao's enemies run out of hand cards and Lu Xun only has one hand card, he can draw Lu Xun's hand card without adversly affecting him, as he will draw another card immeditely. Lu Bu/Xu Chu/Ma Chao/Zhang Fei and other similar characters - These characters have extremely good offensive abilities to which Lu Xun has no reliable defense. Sun Ce (with Sun Ce as king) - Sun Ce's "Takeover" works very well with Lu Xun, as Lu Xun can Compete with Sun Ce to get rid of useless hand cards to more easily activate "Linked Camps." This makes Lu Xun excellent as a loyalist, rebel, or spy when Sun Ce is king. King Lu Xun is a mediocre king. He is quite fragile with few defensive abilities. Lu Xun can be a good loyalist. He can hold Peaches in his hand to keep the king alive without worrying about rebels using Steal to get these cards. Also, they will be less likely to use Break on his hand cards, as he continues to draw cards if he runs out. Due to the previously-mentioned reasons, Lu Xun is an excellent loyalist to Sun Ce. Rebel Lu Xun can be a good Rebel. If he gets the Crossbow and is in range of the king, he has a good chance of finishing him. If Sun Ce is king, he can use Sun Ce's "Takeover" to rid both characters of cards, weakening Sun Ce while allowing Lu Xun to get rid of hand cards that he cannot use. Spy Lu Xun is probably not the best spy pick. He has good abilities, but he has nothing to prevent or deter an all out assault by other players. If Lu Xun is chosen for this role, he must keep a very low profile. Lu Xun has amazing abilities, but he is not without his flaws. His powers do not mesh well with those of other characters, making him somewhat of a loner. In addition, he relies on luck to get good draws that can be used during his turns and keep him alive outside of his turns. It makes matters worse that Lu Xun becomes 'left behind' as more and more expansions are released. With the Battle Expansion, the Steals and Captures become diluted in the deck, making "Humility" less useful.